DEATH OF A SALESMAN by Arthur Miller presented by the ENSEMBLE theatre at the Seymour Centre. This play was first performed in 1949. A year after that premiere on Broadway Miller was asked to write a first anniversary item for the New York Times. Of many observations the last paragraph is worth noting: “So what is there to feel on this anniversary? Hope, for I know now that people want to listen. A little fear that they want to listen so badly. And an old insistence – sometimes difficult to summon, but there nonetheless - that we will find a way beyond fear of each other, beyond bellicosity, a way into our humanity.“ Last night in the Seymour Centre we wanted to hear. And there is a fear (disappointment) that we still need to hear so badly. This is a great play. It is my pick for the Best Play of the 20th Century. (Not counting THREE SISTERS.) The capacity it has to stimulate the mind and move one’s soul is overwhelming. Miller was a tremendous admirer of Ibsen and his use of theatre as a tool for social change (agenda) and of the power of the debate and catharsis in the Greek Dramas. This 58 year old play stung members of last night’s audience to tears. Its’ truths, its’ power is as significant today as it ever was. The Design both Costume and Set by Judith Hoddinott, meets the needs of the complex expressionistic / naturalistic shifts in the text. The lighting is not as detailed as could be in assisting the shifts of times, and the Sound not as useful as it should be. The director’s care with these elements and the guiding of the actor’s lacks the meticulous demands of the writing. The direction is sterlingly adequate. At best solid. Whether it is the lack of time (the rehearsal time very short) or just a lack of rigorous attention from the Director, Sandra Bates, and her assistant, Jennifer Don, only the company can know best. Sandra Bates obvious skill, which is no small gift, is choosing the play and then casting it well. But that is the role of a Producer rather than a Director. Sean Taylor as Willy Loman is impressive with a vocal timbre of some substance, and a physicality of exhaustion that gives weight and proper gravitas to the character. The performance is well conceived but maybe just a little too contrived. There are moments when the actor as technician seems to be going through some “Acted” gear changes. It does not always appear to be organically spontaneous. One can see the craft. The brio of possession of the actor by the character is absent and robs it of its potential shattering life force. The performance is too careful and lacks real danger in execution. It is nevertheless ultimately powerful. Jacki Weaver is, (relatively,) playing a subservient role as the wife Linda but brings all the work to a more than satisfactory conclusion with her final graveside lament. The sobbing sound drifts from that of an old and beaten woman to that of the sobs of a young optimistic bride. The sound of the sobbing, devastating because of the show of what was once optimism for the future with the “handsomest man in the world”. Anthony Gooley as Biff is powerful in the last great tragic act but he needed to be physically simplified. An abundance of physical tics and twitches sometimes interferes with our participation in the emotional depths of the character. The secondary activities are expressions of what we with less to read would be able to endow the character. The directors could have solved these things. The best work comes from Tom O’Sullivan who tactfully and cleverly shows us the journey that Miller has crafted for Happy. It is a wonderful piece of acting and construction. The character revelations are masterly piece by piece. Moment by moment Bit by bit. 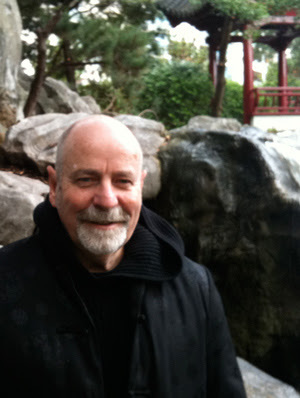 O’Sullivan’s sense of timing in the tempo of delivery in his scenes. throughout the play is impeccable and thrilling and lead the other performers to match him. (The restaurant scene in Act 2 for example.) The rest of the company are very committed and clear, notably Adriano Capelletta, Olivia Pigeot and Jonathan Prescott (particularly as Stanley, the waiter). It is an object lesson to read Arthur Miller’s recollection of the preparation of the original production in his autobiography TIMEBENDS to appreciate the intricate and meticulous detail that is needed to create the highest achievement. Kazan and Mielziner and Eddie Kook toiling tirelessly and demandingly in all areas of the production with their actors and crew. 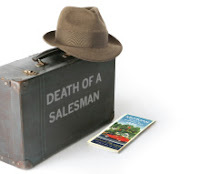 However, The Play Is The Thing, and DEATH OF A SALESMAN is more than worth the time spent with it at the Seymour Centre. It has been such a disappointing year of performance so far. (Honorable exception, arguably, being Lachlan Philpott.) Every ambitious playwright, screenwriter should be made to firstly read this play and then see it translated into life on stage, over and over again. It is an exemplar of great dramatic writing. Wish: to see a greatly prepared AFTER THE FALL. Are you listening Cate and Andrew?